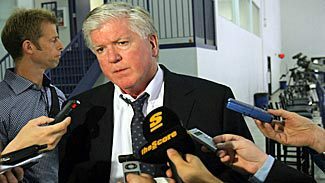 Toronto Maple Leafs GM Brian Burke told reporters Tuesday that he doesn't expect many battles for jobs when training camp opens Sept. 16, but he does expect his team to be in the playoff hunt this season. Burke feels that there is only one opening to be had, and it could be won by one of the team's younger players. "If you notice, we've left one spot open," Burke said. "We want some competition for one of the forward spots. Whether that's Matt Frattin or Nazem Kadri or Joe Colborne or whomever, we do want to have some competition open for a spot. Other than that, we think we've filled the holes. But we're going to find that out." The Leafs made a push this summer to land free-agent center Brad Richards, but he decided to sign with the New York Rangers. That didn't prevent Burke from improving his roster with the additions of center Tim Connolly, speedy winger Matthew Lombardi and defenseman Cody Franson. Burke believes those additions to a team that finished 18-9-6 last season will have the Leafs in the hunt for their first postseason berth since 2004. "We think we made some changes that have made our team dramatically better," Burke said. "We made some changes to the coaching staff, we made some changes on the blue line and we made some changes up front. And we think those things will put us in the position where we want to be, which is in competition for a playoff spot."